B1868. SPEEDS & KEYS, Vol. 1 (Gramophone Co. 1898 - 1921) - by Chris Zwarg. Berlin, Truesound Transfers, 2018. 408pp. Spiralbound, with sturdy metal-spring binding. No remaining copies in our stock, however being re-ordered! Reserve your copy! 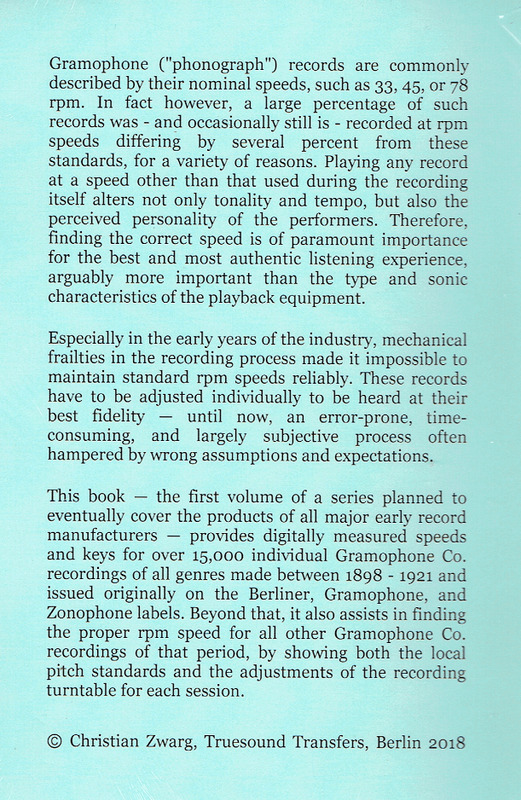 "This handbook - first in a series intended to eventually cover a wide range of labels and studios - is the fruit of many years' research into the intricate matter of correct playback speeds of early "78 rpm" records, taking into account the very variable pitch standards still common in many places at the turn of the 20th century, the mechanical vagaries of early recording lathes, and ad-hoc transpositions imposed by arrangers and singers. The author has developed reliable computer-aided methods to measure both the average overall pitch of a digital transfer of any record, and the exact turntable speed used to make the transfer. 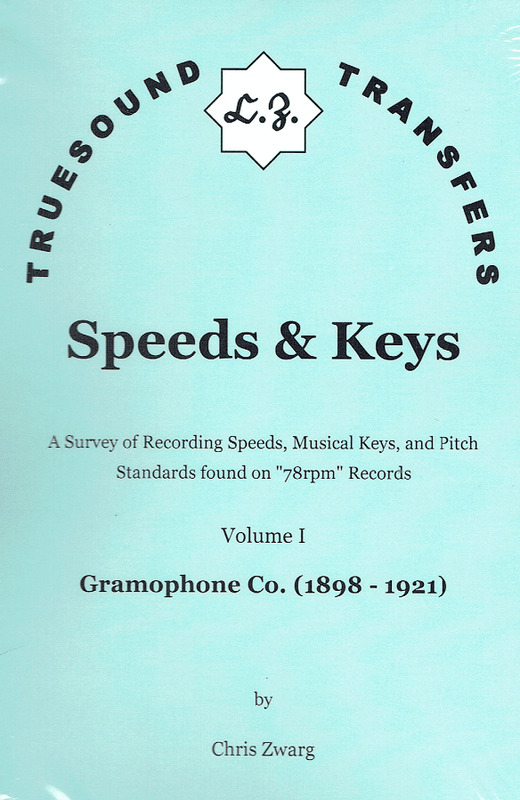 With this new data of previously unheard-of accuracy, over 14,000 Gramophone Co. recordings of all genres from the first two decades of existence were analyzed and described in terms of their musical keys, pitch standards used, and playback speeds. The resulting book is 408 pages, with sturdy metal-spring binding to hold up well in frequent use." "Let me give you a warning. You think you are hearing my voice; but unless you know how to use your gramophone properly, what you are hearing may be something grotesquely unlike any sound that has ever come from my lips. [...] I have records of famous singers and speakers who are dead, but whose voices I can remember quite well: Adelina Patti, Sarah Bernhardt, Charles Santley, Caruso, Tamagno; but they sound quite horrible and silly until I have found the right speed for them."